Could Ayatullah Khamenei Be Vulnerable? "From revolution to freedom"  that was the message that spread among supporters of Iranian opposition leader Mir-Hossein Mousavi today. The phrase refers to the two main squares in midtown Tehran, where a large demonstration took place to protest what millions of Iranians believe was a rigged presidential election. 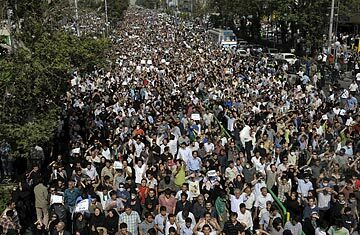 And although the Interior Ministry kept broadcasting a communiqué warning that no permit had been issued for the rally, 2 million to 3 million Iranians from a broad cross section of society converged on Freedom Square to demand a recount. "Until you return my vote, I won't be going home tonight" was one of the chants at the demonstration, which was organized on the Internet and by word of mouth. While the police and special security forces have dealt harshly with demonstrators over the past few days, today's rally was held peacefully with an almost total absence of any crowd-control forces, at least until dark. After sunset, there were reports of government militia firing on demonstrators, purportedly killing at least one. The size of the demonstration today came as a surprise. After the first day of heavy rioting and street clashes on Saturday, Sunday saw relative calm as special forces officers took up positions on main streets and squares by the hundreds, breaking up any sizable gathering immediately, leading to assumptions that the protests were dealt and done with. But many people participating in the rally Monday said the scale of it was understandable. "Of course people would show up en masse. They know who they voted for," said 44-year-old Ahmad, who pulled out his wallet to show an ID to prove that he was a war veteran. "I was on the war front for eight years. This is not what we had a revolution for, so that they would lie to us." All three opposition candidates attended the rally, though only Mousavi spoke. Difficult to hear above the noise of the crowd, Mousavi said the size of the demonstration made it clear that the election had been rigged. Although the Supreme Leader Ayatullah Ali Khamenei initially congratulated incumbent President Mahmoud Ahmadinejad on his re-election and called the elections a "divine assessment," he took a surprising step Monday by asking the Guardian Council to investigate Mousavi's allegations "with precision," and called on Mousavi to follow existing concerns through "legal means." The move, an attempt to assuage concerns over the alleged fraud, was unprecedented. Ahmadinejad, who won re-election with two-thirds of the vote according to the Interior Ministry, held a large rally on Sunday in one of the town's main squares. Speaking to a sea of supporters waving green flags  in what appeared to be an appropriation of the color used by Mousavi  Ahmadinejad compared the elections to a football game and said those in the streets did not represent a majority of Iranians but were people upset at having lost the game, referring to them as "weeds and dirt." While Ahmadinejad's supporters hailed from a variety of backgrounds, the majority were visibly conservative and included large numbers of basiji paramilitary members, many of whom had driven into Tehran on their motorbikes from surrounding towns and cities to help the special forces control street clashes. Many wielded sticks and chains, and still others were outfitted with what seemed to be police shields, helmets and batons. See five reasons to suspect Iran's election results. See pictures of Mahmoud Ahmadinejad. View TIME's covers from the 1979 Iranian Revolution.